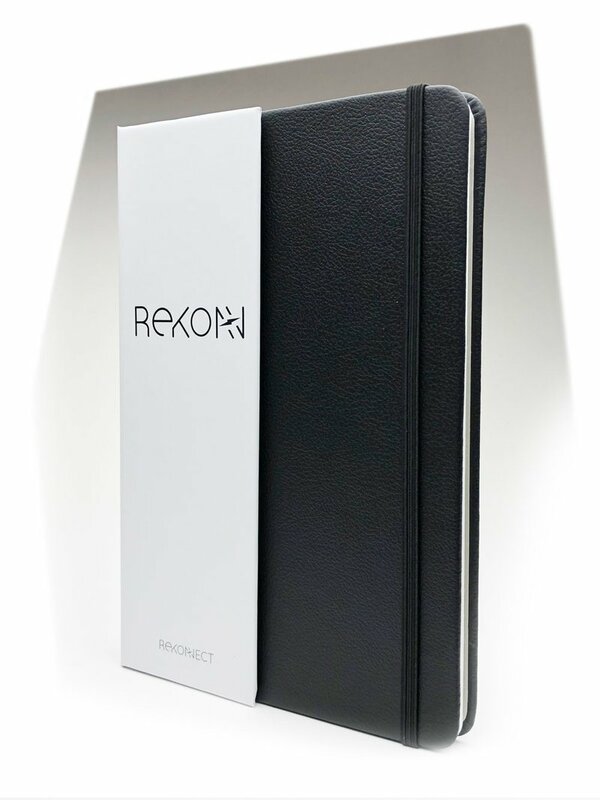 The Rekonect Magnetic Notebook is a patent pending design. The cover has a faux leather exterior and a high-grade elastic band that wraps around the notebook. The spine of the notebook contains a series of magnets that allow for you to easily remove, rearrange, and reattach each sheet of paper as desired. The dimensions of the notebook are 5.5 inches (13.97 centimeters) by 8.125 inches (20.6375 centimeters) and weigh 12.6 ounces (357.2 grams). The notebook comes with 55 sheets or 110 pages. The paper for the Rekonect Magnetic Notebook measures 5 inches (12.7 centimeters) by 8 inches (20.32 centimeters) and is 98 gsm. The edge of the paper has a patent pending mixture that is durable and long wearing. The thin strip allows the page to adhere to the spine of the notebook seamlessly, while still maintaining a sleek design when removed.